India’s First Education Based Unicorn on it’s way! ‘A business cannot be driven by the passion to make money, the passion to change society is far more important.’ Success means a lot to everyone but reading success stories not only motivate us but also help us to grow our startup, right? That is why we keep writing motivational and success story for people like you. Today we will be knowing the guy who’s changing the way India learns. Past midnight, at the play arena: Bengaluru’s popular sporting facility when the last group of players were rushing out, exhausted. Then walks in the Byjus Raveendran and team for their mid night 12 to 2am slot. Employees at think and learn pvt. 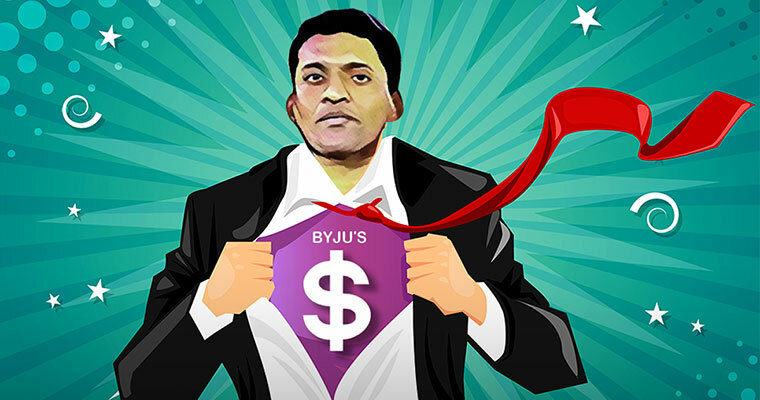 Ltd., Who runs the Byju’s are well acquainted with CEO’s love for football and his habit to use it as motivation. The midnight 2am game was a custom which take place for every two days,and game is played at tilt, he says “i don’t like half measures, whether at work or play” at conversation in coffee shop. Byjus app was now a Harvard business school case study authored by John Jong-Hyun Kim and Rachna Tahilyani, who studies the growth, impact and how can students across the world can use this k-12 app. Raveendran says “A profitable unicorn is a dream” the firm’s revenue is about rs 260 crores last fiscal year and aiming to be profitable in fiscal year 18. “Our ambition is to become the world’s biggest edutech company” says Byju Raveendran. This startup is opportunity for investor who is looking to India for good returns. Last year the company raised $75 million from blue chip venture fund sequoia capital and sofia, the Belgian family office. Byju made a step forward in the global market when they raised fund in a round led by Chan Zuckerberg initiative, a personal fund set up by Facebook founder mark zuckerberg and his wife Priscilla Chan and notably it was their first investment in Asia. Later, World Bank arm International Finance Corp granted it $15 million.“If you see, it is not an area where there are too many giants. It’s a dream that’s certainly possible to achieve.” he adds. Zuckerberg stated that he was optimistic about the personalized learning and hence decided to work with byjus that get these tools to more and more children and teacher all over the world, while announcing the investment into byjus. The BYJU started when Raveendran was working as an engineer with UK based company, he helped his friends to prepare for CAT exam. He was extremely good at Maths so, he was natural choice for his friends and everyone he couched has cracked the exam. He himself scored 100 percentile. “So I decided to turn this into a business. From Monday to Friday, I started taking coaching classes for youngsters in Bengaluru. Once it picked up momentum, I started travelling to Mumbai and Pune to take weekend coaching classes.” he was one man army for all those who dreamed to crack CAT. Later when classroom became to Small, he booked an auditorium for 1200 students. In one of such events Ranjan Pai was amazed to see large group of students listening to his lectures with pin-drop silence with utmost interest. The first fund was raised then by byjus in year of 2013, Aaron capital, a fund of fund of Ranjan Pai and former Infosys board member Mohandas Pai, pumped in Rs 54 crore. Byjus raveendran is from Azhikode, Kerala’s northern district jannie and studied in malayalam medium school. BYJU feels still there is lot to achieve and to bring revolution in the field if education. “The learning app has witnessed great adoption among students across grades, but we are still reaching out to less than 1% of the student population in India. There is a long way to go before we even call it a learning revolution. The need of the hour is a product that will make students fall in love with learning and we strongly believe that such a product can come from India,” he says. A report by private equity fund Kaizen has stated that over $1 billion has been channeled into the Indian education sector since 2007. “What keeps us going is the fact that we can empower millions of students by helping them become lifelong learners.” he added.